After treating my readers to a Beverly Hills happy hour review last month, I return to reviewing with a restaurant more to my taste and pocketbook. Jasmine Market & Deli in Culver City, featuring cuisine from Burma and India, is the next eatery in the Chef's cheap$kate sights. Jasmine has a couple of Evening/Weekend Specials that are indeed special, including two great soups: Coconut Chicken Soup and Fish Soup. After it was touted in Los Angeles Magazine's May Issue in the article "101 Cheap Eats," and glowingly reviewed by Jonathan Gold for the LA Weekly, I grabbed my camera to get the goods on exotic cuisine served at Jasmine - one can only eat out so many times a month at Chef Marilyn's 99 Cent Soul Food Express ! 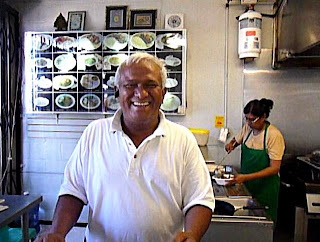 The cheerful owner, Soe Lwin, is part Indian and Burmese, and the menu recipes his wife Khin has created reflects this. He describes Burmese dishes as milder than typical hot/spicy India ones. He does provide red chile flakes, toasted on-site, for extra heat. Contrasting nicely with the India fare are his wife's unique salads and soups that are "typical of a small Burmese village". Drinks are exotic sodas and tea. Be sure to splurge for fresh-made Naan with garlic or onion -- only $1 over the 99 cent base price. First up: the Fish Soup is a rich melange of Tilapia fish broth with Burmese spices. The unique textures include a mild, celery-like crescent of banana tree trunk, the tasty crunch of "tempura" fried lentil beans (my favorite ingredient), and a sprinkling of cool fresh cilantro sprigs floating in a warm broth loaded with slippery, silky rice noodles. All this for $3.49 (plus tax) for a large bowlful. Next up, for the same price: Coconut Chicken Soup with Chinese noodles. This creamy coconut curry broth is heavy with chunks of chicken and slivers of red onion covering yellow Chinese noodles. It's a less-exotic palate pleaser, for those who prefer more familiar flavors. 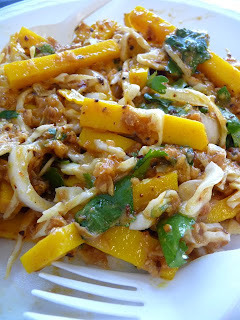 Another traditional Burmese dish is an enticing Tofu Salad, uniquely made with lentil bean tofu, homemade by the owner's wife. Cut into bright yellow strips, lentil bean tofu is not bland like normal tofu -- you can taste the nut-like lentil source. Studded with clumps of fried garlic, crunchy cabbage and onion, it's more like a pungent warm slaw than a salad. And it comes with the most intense cabbage soup -- flavored with powdered shrimp. It's one heady, aromatic soup and salad. This Chef's wife loved it. Both soup specials and Burmese salads are served evenings from 5 p.m. to closing, and all hours during the weekend. 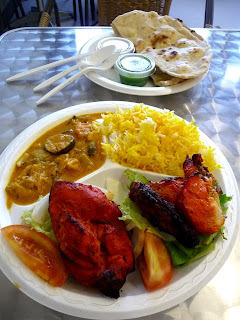 One of the best deals is the $4.99 Tandoori Chicken Lunch Special, served 11 a.m. to 4 p.m. Tuesday to Sunday. It is cooked when ordered; you can have a quarter segment of white or dark meat chicken. Another recipe from Soe's resourceful wife, the flavorful tandoori coating is a familiar favorite available here at half the cost of most India restaurants. This lunch special is served with fluffy fragrant Saffron Rice, Vegetable Curry, a large round of fresh-made warm Naan Bread, and garnished with lettuce, raw onion and a couple of tomato wedges. This generous lunch special had customers walking up to the counter requesting containers for leftovers. 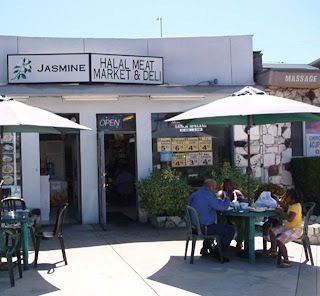 Jasmine Market & Deli is located in a strip of storefronts along Sepulveda Blvd. just south of Washington Blvd., in Culver City. It is easy to miss -- look for the white umbrellas and tables out front. The market inside has more seating, a counter for ordering, and a kitchen which includes a tandoori oven. 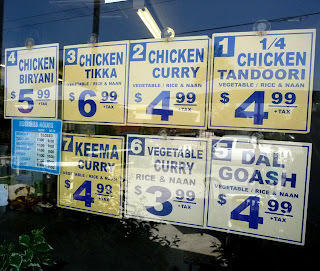 The everyday menu offers typical India-style fare at bargain prices. Other lunch specials are available from 11 a.m. to 4 p.m. every day except Monday - they're closed. Dinner prices are still cheap at a couple of dollars more - well below $10 for a complete dinner. This is a restaurant tab The 99 Cent Chef is happy to pawn off -- or rather, pick up. Jasmine Market & Deli is in a simple setting that draws the locals. Parking out front on Sepulveda Blvd. is metered until 6 p.m., but the service is fast. This is a great deal any day of the week (closed Monday) for a quick drop-in tasty, exotic, meal. Below is my video visit. Play it here. The video runs 4 minutes, 25 seconds. Typical India fare, along with Burmese soups and salads. No alcohol - tea, juice and soda. Dine in, or to go. Catering is available. Attached is a small grocery store carrying large sacks of rice, curry seasonings, and other Asian goods. 99 thanks to Soe Lwin, his wife, Khin, their son Kaung and everyone behind the counter at Jasmine Market & Deli for putting up with my questions and allowing me to shoot. And thanks to my wife Amy, for shooting the Chef as he stuffed his face! Chef Marilyn looks like an awesome lady. Great restaurant review. If I'm ever down that way I'll stop in. Our food in Canada is pretty expensive since we a)don't have cheap Mexican labor and b) import almost everything since it's so freaking cold here most of the time. Where I live it's mostly grains and beets grown and a large supply of cattle. We also have a large Ukrainian and German Population that came during the land rush so many years ago. I am fascinated by Southern Cooking, but I don't think we have any around here. Hi Shelley, I have a German recipe coming up - sausage, beer, apples & sauerkraut. What goes into Ukrainian cuisine? Nothing wrong with beets & beef! From my experience with Ukrainian cuisine, it contains a lot of cabbage rolls (rice, cabbage, beef, tomatoes) perogies (dough, cheese, potatoes and topped with sour cream, onions and bacon) I've had dessert perogies (stuffed with blueberries) and covered with maple syrup. My family isn't big on sourkraut but the key is to drain and rinse it with water before you eat it. There is also Latkies (potato pancakes) and I'm sure a whole bunch of stuff. Sausages and soups and anything else you have just lying about the grain belt. I can get pretty rich but it would get worked off if you were farming all day. I'm now looking forward to your post.